Bangkok / 28 January 2019 - Bangkok Airways Public Company Limited in collaboration with Grab, a ride-hailing, food delivery and logistic services application offer a special privilege for Bangkok Airways passengers. 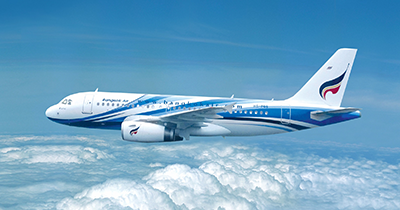 Passengers of Bangkok Airways who book and purchase their trips via www.bangkokair.com and Bangkok Airways mobile application and travel from 24 January – 31 March 2019 will be entitled to a 200-Baht-credit to enjoy Grab services including GrabBike, GrabCar, GrabTaxi, GrabCarPlus and advance booking except GrabFood. To take advantage of this offer, passengers must book their flight tickets via www.bangkokair.com or Bangkok Airways mobile application only. To get Grab discount, passengers must register http://www.bangkokair.com/regisflypgfreeridejan19 from 24 January - 4 February 2019 only.